It was fishing on the river where Sue Larson and Don Voisin met, and today this married couple continue to share their passion at their fresh fish and seafood market ‘Out of the Blue’ in Bayfield, Ontario. 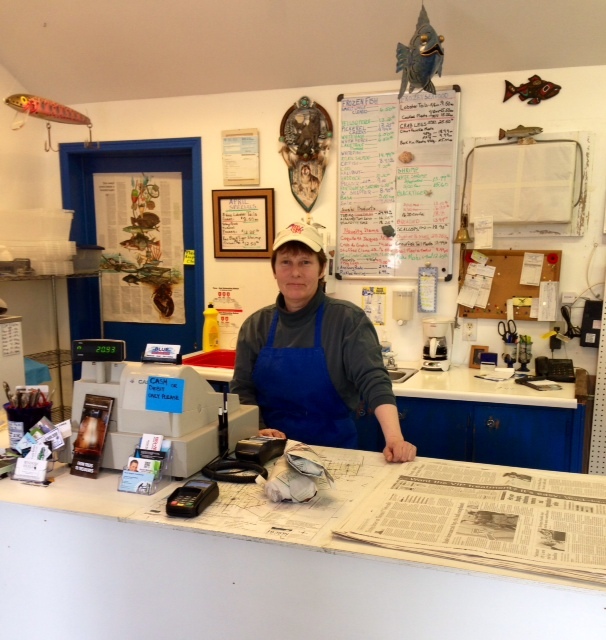 Six years ago, Sue and her husband noticed that Huron County was lacking a supplier of freshly caught fish and wanted to open up shop and bring in their own fare from the Great Lakes. Since then, they have cast their net wider to import the best lobster tails from Cuba and even catfish from North Carolina that they cure themselves in their at-home smokery. It has been claimed by the residents of our area that they sell the best quality and variety of fish on the West Coast, which is supported by the many restaurants in Huron County that feature their local fish on their menu. This claim is also validated by returning international tourists that stock up before they head home to South Africa, China and Jamaica to name a few places. While chatting with Sue, she said that their claim to fame is definitely their wide variety of smoked fish, so I decided to take the plunge and get the smoked catfish. Even though I can be a picky eater and was hesitant to try catfish, I was blown away by the moist light flavour and have even been back to get some more since writing this article. It was at that time where I also decided to turn up the heat in the kitchen and try out local Lake Huron rainbow trout. Sue gave me a fail-safe recipe that she swore by, and even laughed a little when I jotted down her straightforward directions on my notepad. As promised, this recipe turned out fabulously and the trout was perfectly flaky and had a nice delicate flavoring. If anyone else would like to test their culinary talents and support local, I too highly recommend buying from Out of the Blue Fish and Seafood Market. 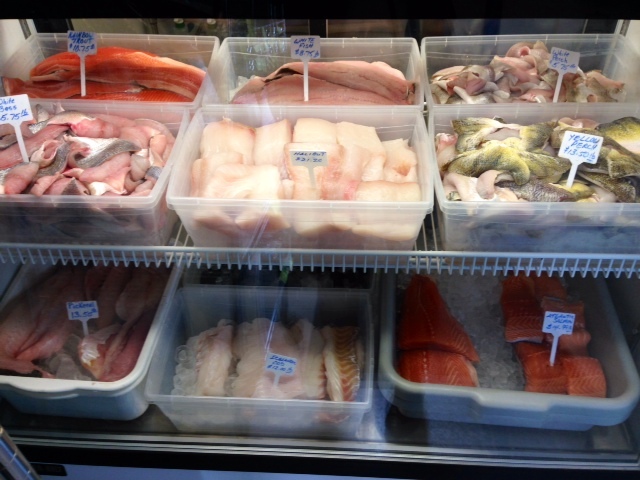 Out of the Blue’s fresh fish display case with varieties of bass, halibut, perch and pickerel among others. 1) Preheat oven to 400 degrees Celsius and line a baking tray with aluminum foil. 2) Place the trout on top of the foil and drizzle on soya sauce and sprinkle with salt and pepper to taste. Top with thick slices of tomato. 3) Bake uncovered for 12-15 minutes and serve with a lemon wedge. My delicious rainbow trout creation! Situated right off of the Bayfield square makes this a great location for County residents and summer tourists to stop in and acquire a taste for their product. Sue wraps up my rainbow trout and catfish in newspaper and calls it “the old English way”.